It's cheap, but is it safe?? A couple of weeks ago we were doing a turnkey project for a customer, and the project called for two relay outputs to drive 24VDC loads. To keep the cost to the customer down, we decided to buy a 3rd party 2-relay relay board. It was much cheaper than one of our own 8-relay/8 input XIRO16 boards. When the boards arrived we took a look and got a bit of a queezy feeling of something not being quite right. The board was advertised as rated for switching 240VAC at up to 5A. 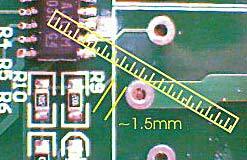 However, the spacing between the printed traces for the relay contacts and the traces on the drive (coil) side looked far too close together for 240V. In the end we removed the relays to get a full view. It turns out that the spacing between coil side and contact side, hidden under the relay, is only about 1.5mm. If you are switching mains (120V or 240V) on the contact side, and a user could touch any exposed circuitry on the coil side, then YES it matters. Someone could die, and if you are the supplier of the end equipment you could be sued out of existence just for selling it, let alone killing someone. Not to mention that you would never get your product approved by any regulator authority. There are legally enforcable rules about the minimum trace-to-trace spacing that must exist between mains circuits and Extra Low Voltage (ELV) circuits. In the US and Australia it is generally 6.4mm (0.25 inches). In Europe it is 6mm or 8mm, depending on the class of equipment. The controllers we made that control day spa equipment on the Queen Mary II (water close to electricity!) uses 8mm rules. On our regular XIRO16 relay board the spacing exceeds 6mm. Then there's the relay itself. The relays in the board we bought in are rated at 1.5kVAC coil to contact breakdown. The rules in Australia require 3.75kVAC, in Europe sometimes more. The relays we use in the XIRO16 are rated 4kVAC coil to contact. And our customer's project? Well, in that instance we were only switching 24VDC at an amp or so, so it was fine. The point, though, is that the boards we bought were described by their maker in a way that implied they are suitable for 240VAC use, without any mention that doing so could create a dangerous situation unless safety insulation is provided elsewhere. It also explains why we sometimes despair at some of the low prices charged by competitors ... they may be taking short cuts that compromise safety or reliability. Here's a little something to amaze and entertain the most jaded techno-geek (it certainly amazed me!). A series of movie clips describing mechanical targeting computers in the US navy. Click here to view on YouTube. Have you seen our easy to digest Finite State Machine tutorial?